AudioCodes Mediant 1000B MSBG Chassis, T1 DSU/CSU WAN, OSN3, 2GB RAM for MS OCS R2 Hybrid Gateway Config. Includes CRMX (embedded CPU), 3 GE switched LAN ports, 1 GE WAN port, fan tray, single AC power supply, OSN Server (V3) with 2GB RAM, HDD with Microsoft Mediation Server R2. Supports VoIP gateway functionality and basc routing (static routing, RIP v1/v2, VLAN) and basic Security package. Product does not include RS-232 cable (part #M1K-RS232) which is used to access the CLI for serial communication. The Mediant 1000 MSBG is an all-in-one multi-service access solution for Service Providers offering managed services and distributed Enterprises. This multi-service business gateway is designed to provide converged Voice & Data services for business customers at wire speed, while maintaining SLA parameters for superior voice quality. 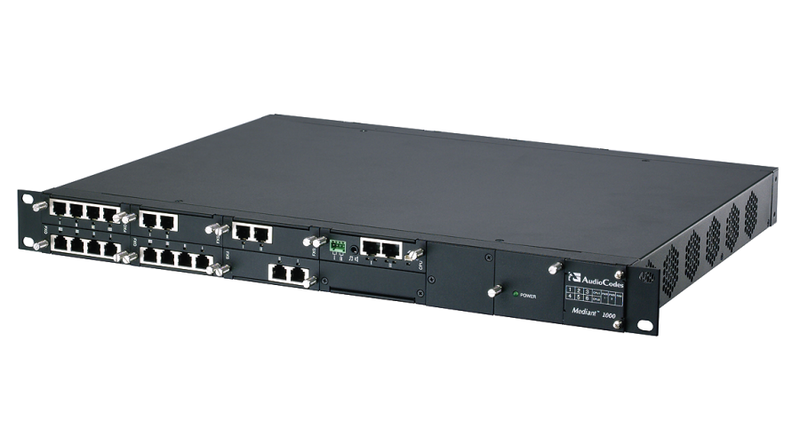 The Mediant 1000 MSBG is based on AudioCodes' VoIPerfect best-of-breed Media Gateway technology, combined with Enterprise class Session Border Controller, Data & Voice security elements, Data Routing, LAN Switching and WAN Access. These services allow smooth connectivity to cloud services.